Color Theory uses the best paint products available anywhere. 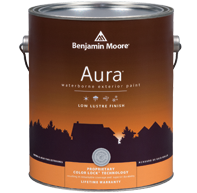 Available in our “Premium Package” The Aura line of paint from Benjamin Moore offers a finish comparable to none. Superb coverage, durability, environmental friendliness and color richness are Hallmarks of this great product. Available in our "Standard Package" for an ultra-smooth, rich, silky finish, count on Cashmere. This paint easily glides off the brush or roller and the result is a difference you can definitely see and feel. Looks, feels and applies smooth and buttery. Silky, low-stipple appearance that looks good from all angles. Scrubbable for easy cleaning and maintenance. Ideal for our cabinet projects this product offers a smooth and luxurious finish for cabinets, doors and trim, Emerald® Interior/Exterior Urethane Trim Enamel delivers a finish that withstands wear and tear and goes on in fewer coats. Durable finish is great for windows, doors and trim. Perfect for areas that get cleaned frequently. Available in a range of Sherwin-Williams colors and custom tints in satin, semi-gloss and gloss sheens. Don't let weather worries ruin your painting schedule. Resilience® Exterior Paint gives exteriors exceptional moisture resistance so you don't have to postpone painting when the forecast calls for rain. Resilience can be applied in temps as low as 35°F and offers outstanding hide, coverage, durability and dirt-resistance. Formulated with exclusive MoistureGuard™ Technology for revolutionary moisture resistance in half the time of traditional latex paints — paint later in the day with confidence and less concern about dew or impending rain. Outstanding hide, coverage, durability and dirt resistance. ARBORCOAT Premium Exterior Stains offer a variety of opacities in an array of captivating colors that let you express your own unique style. These finishes are designed to enhance the appearance of your deck, siding, or outdoor wood furniture. Arborcoat is available in Translucent, Semi-Solid and Solid finishes. Specifically formulated for ceilings, Waterborne Ceiling paint is ultra flat, hiding common ceiling imperfections for a look that is virtually flawless. Regal® Select Exterior REVIVE™ for Vinyl Siding is a premium exterior coating specially formulated for optimal performance on vinyl siding and trim.